Colwright Designer Delivery provides white glove installation services, warehousing solutions, and shipping services nationwide. Our highly secured and climate controlled warehouse facility offers in-house furniture restoration and upholstery solutions. From receiving to final mile, we provide exceptional service and expert handling and care. From one piece to and entire house, you will receive the white glove experience. Care and protection are the highest priority for our experienced and professional installers. We provide a wide range of short & long term warehousing solutions including: receiving, inspecting, secured storage and online inventory control. We offer the highest standards in fine art Installation, specialized packing, and flexible storage. Our art installation experts have extensive experience in the proper handling, placement and installation of fine art. Whether across town or across the country, we offer professional packing & custom crating services. Our skilled and professional movers are equipped with the tools necessary to complete your move whether residential or commercial. A dedicated project coordinator along with our experienced packing crew will administer your move with the highest care. 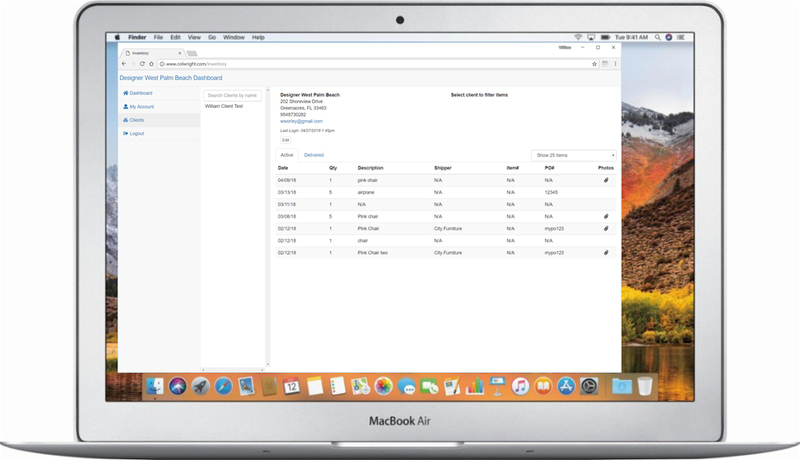 The Colwright dashboard is an online management tool where you can view all your items in one place, including arrival photos, condition and shipper details. I consent to Colwright Delivery Services collecting my details through this form.